The title alone would encourage a bookshelf browser to reach for this volume. A humorous play on words conjuring visions of exuberant Greek revellers ruining a restaurant’s crockery budget, or of polite Brits commenting on some jolly good food. Smashing Plates – Greek flavours redefined does touch on both the passion of Greece and the quality of some smashing food. Maria Elia was brought up surrounded by food. Her dad was a Cypriot chef so Maria had a childhood of total taste immersion. She dips into her culinary heritage to offer dishes that range from the rustic to the refined, but all have the same common denominator – good taste. 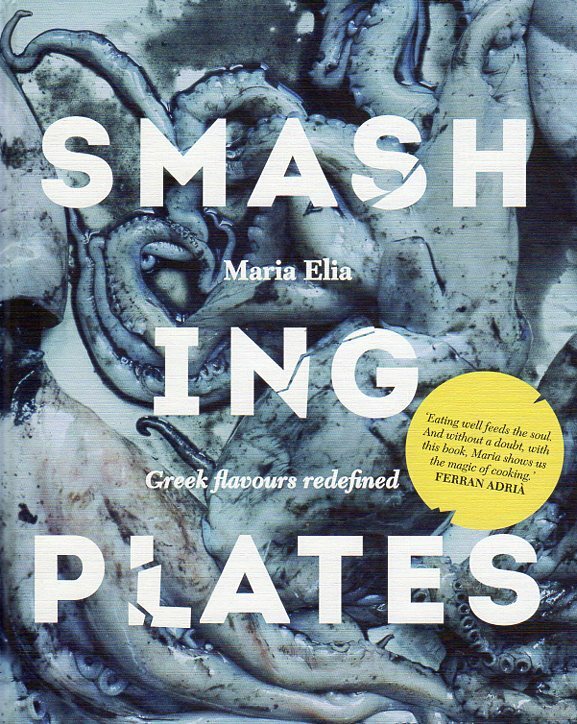 Smashing Plates – Greek flavours redefined offers recipes for complete dishes but also for those constituent parts such as goat’s milk ricotta and even homemade halloumi. The book would likely be popular just for that recipe alone. Sardine keftedes are store-cupboard gems. Maria elevates the humble and much overlooked can of sardines to new culinary heights. They have had a reputation of old-fashioned tea-time fare but this book presents another face of that healthy fish as the key component in a cooked patty served with salad or even as a filling for a crusty baguette. A simple but must-try from Smashing Plates is Condensed Milk Ice-cream. It’s another one of those forgotten ingredients: condensed milk is thick and rich with an unmistakable flavour. This is a simple custard-style ice-cream and Maria suggests flavouring it with cardamom. My pick-of-the-book is another sweet recipe and is that for Coffee Custard Doughnuts with Fennel seed Sugar. This is a departure from traditional Greek doughnuts which are soaked in a syrup after frying. They are extremely sweet, although delicious, but Maria’s alternative offers a dessert that is less sticky to eat and retains its cake-like properties. The custard filling is easy to make as it uses the much-loved Bird’s Custard Powder. Yes, it’s retro and it works! Smashing Plates – Greek flavours redefined is unmistakably Greek, but Maria’s approach is contemporary and thoughtful. She has penned a volume that is practical for the non-Greek home cook, and indeed one that has never even had a Greek grandmother. Chef Maria Elia has worked with the celebrated Ferran Adria and it’s his words that grace the front cover of this book: “…Maria Elia shows us the magic of cooking.” Endorsements don’t come much more worthy than that.